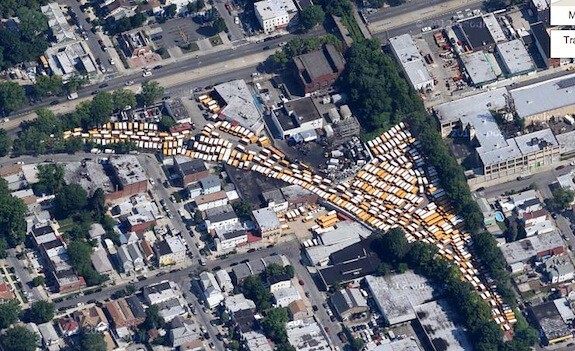 Even a school bus parking lot wouldn’t be a real barrier to Rockaway Beach Branch reactivation. In the circle of transit life, popular local buses lead to bus rapid transit which leads to light rail which leads to subway lines. It’s not the most cost-effective or efficient way of building a transit network, but it’s the flow of demand. Ideally, if a corridor is popular enough, we wouldn’t be watching politicians falling all over themselves to talk up a bus lane and instead we would go straight to the highest-capacity, highest-speed transit option. Could this play out along the Woodhaven Boulevard corridor? For transit in New York, the biggest obstacles to growth are speed and cost. The MTA can’t get a handle on costs, and projects come with price tags significantly higher than they are in similarly situated countries around the world. Furthermore, the MTA can’t nail down timelines, and projects that should have been finished years ago are still inching toward revised finish lines. These are operational and political barriers, but if enough forces line up behind a project, it can become a reality. Lately, deep into Queens, an unused rail right-of-way has emerged at the center of a storm pitting advocates who are usually on the same side against each other. One group wants to turn this valuable rail right-of-way into a linear park akin to the High Line. Their plan isn’t clear on funding and includes numerous contradictions — such as promoting the idea with a dedicated bike lane that parallels Woodhaven Boulevard while assuring neighbors the park would close early at night. Another group wants to do nothing, and a third group — also not so clear on funding — wants to reactivate the right-of-way as part of the subway network. I’ve covered this debate for years and am a voice for subway reactivation to an extent. After Gov. Andre Cuomo threw taxpayer money behind a biased study conducted by a pro-parks group, I’ve called for similar funding for a true alternatives analysis. We can’t dismiss the rail reactivation idea knowing now what we know about New York’s need for a resilient rail network in the face of increasing storm threats, but no official study has been released in nearly two decades. I would not be so quick to dismiss the reactivation of the Rockaway Beach rail line as too expensive and unrealistic. Notwithstanding the project’s necessity, phase I of the Second Avenue subway has a $4.45 billion price tag. In comparison, rehabilitating the rail’s existing infrastructure will cost about $800 million. This modest investment will significantly raise the quality of life in the far reaches of Queens. Furthermore, as suggested by a recent Queens College study done at the request of Assemblyman Phillip Goldfeder, up to 500,000 daily rides may be generated by the reconstructed rail line, and I completely expect ridership to grow over time. Lastly, as a trackworker, I know firsthand that reconstructing the Rockaway Beach right-of-way is much more feasible than opponents claim. Following Hurricane Sandy, TWU Local 100 members rebuilt 3.7 miles of the A line (almost the same length as the Rockaway Beach segment) “from the ground up” within seven months. Restoring the damaged track, signal and electrical infrastructure with in-house labor cost the Metropolitan Transportation Authority only $75 million. I’ve always been skeptical of the Goldfeder-funded study that claimed 500,000 trips per day. That would make it among the most crowded subways in the system, and the population of that area simply doesn’t support that kind of demand. Still, the ridership wouldn’t be insignificant. To me, though, the intriguing aspect of Samuelson’s claim that construction wouldn’t be nearly as costly as opponents of rail reactivation claim. As New York State does not allow private entities to adversely possess government land, the acquisition costs even for land that isn’t currently physically reserved as the right of way would be slim to non-existent. Shoring up the structure for 21st Century rail operations and meeting federal safety guidelines would be more troublesome, but the A line to the Rockaways was part of the same ROW. Recent history may be instructive. It’s ultimately an uphill battle for anyone to see anything happen here. The park plan is well over $100 million away from becoming a reality, and real reactivation would be, optimistically, ten times that amount. But without clarity, we’ll never know the costs, the benefits and the right way forward. At the least, people whose voices deserve to be heard are thinking about it. Considering the city’s needs, that’s a step in the right direction. As someone who actually lives out there (Broad Channel) and has taken the A train through Brooklyn at all hours of the night for over 30 years I sure they hope they will build rail. I watched them rebuild the 3.7 miles of track during Sandy and I am sure that it will take them longer to make sure the tressels and bridges are in good shape I am sure it won’t take much longer than what it took for the Sandy rebuild. With the extra people taking the air train and coming to the casino the line needs to be built. Let’s build a southbound platform for the casino and bill them for half of it and give them the naming rights for 50 years. As someone who used to visit friends in the area, I know how useful the line would be if reactivated as part of the subway system. The real NIMBYs are those people who gambled on property ownership on a line which was abandoned. At a time where we don’t have enough mass transit, rehabilitating this line makes a lot of sense. But I am a person who believes in transit expansion – which includes building new 4-track Els to the city limits. The more cars we can get off the road, the easier it will be to get around NYC. And the only way to do that is to increase the amount of rail transit in both Manhattan and the outer boroughs…. The expensive part of a Rockaway Branch reactivation is a track (tunnel) connection to a (the QB IND) subway line. -run trains from both locations to this new terminal. …..In the future, such a link could be part of the originally envision QB bypass connected to the underused capacity of the 63rd Street upper level. …..Bring an LGA shuttle to Woodside instead of Citified could further enhance this hub. I think the TWU leader speaking out in favor of this project and how little it would cost gives it a huge boost. Merging the LIRR with Airtrain and the subway (A line) probably won’t happen. They likely would need to get rolling stock that could handle operating on all three systems. It would be just easier to budget a short tunnel connection to the Queens Blvd line. Just extend the one of the Queens Blvd local routes to the Rockaways this way. This would bring people to the casino and help bring more people to the Rockaways (further promoting development) as Western and Central Queens gentrify. My main issue is the use of the term “reactivation”. In reality, there is little there to reactivate. A large % of the tracks are destroyed, and will need complete replacing. Not to mention the massive soil erosion that has occurred over most of the right-of-way (this will be an issue for a park too, of course). The old stations are all destroyed. Etc. This is not a “reactivation” project. It’s building a new line from scratch, using an existing ROW. That, along with ignoring the MTA’s capital programs awfulness (years behind on existing projects, billions in over-budgets and waste), there is too much fantasy talk going on here. We’re still wondering if we’ll even get Phase 2 of SAS (let alone 3 & 4), let’s not delude ourselves into thinking this will happen anytime before 20 years from now. Additionally, Rome wasn’t build in a day. Reactivation is in reference to the ROW. It’s still there. As Samuelsen wrote, the TWU/MTA essentially did the same rebuild for the Rockaways after Sandy. It’s really a matter of will. That said, let’s not delude ourselves into thinking the park will happen anytime before 20 years from now either. What VLM said, basically. “Reactivation” has technical and maybe legal meaning. If the ROW were never deactivated, all the physical plant would have been replaced at least once by now anyway, so that’s not an outrageous expense. Speaking of delusions, what exactly is the “the MTA’s capital programs awfulness”? Not to defend the status quo, but the MTA seems to do exactly what it’s told to do. SAS and ESA were born out of legislative horsetrading, and the design came from letting contractors design for themselves instead of the users – with the caveat that they avoid annoying NIMBYs. The users would probably happily take a cheaper, more accessible cut and cover project closer to the surface. Most of the sources of cost overruns aren’t here, like land acquisition and cavernous deep stations. They’d need to come up with new ones. Put simply, reactivation is akin to recycling. take the existing row & recycle it for future transit use. Billion dollar costs probably are a bit absurd here, even for New York and even with the QB connection. The ~$20M/mile Samuelsen cites for “restoring the damaged track, signal and electrical infrastructure with in-house labor” is probably rather higher than first world electric rail construction. The trick with Rockaway would be to simply avoid over-flourishing the project with ostentatious/oversized structures – which explains a lot of our cost problems with the SAS, 7, and ESA. It really should be in the low nine figures, and with the build in New York penalty the expectation probably should be more in the mid nine figures. Woodhaven seems like one of the very few corridors in NYC where the ITDP fantasy BRT actually makes some sense. I don’t see how that negatively impacts the argument for reactivation, and if anything reactivation would complement the BRT service. Not familiar with the area but I believe it means that entities currently squatting on MTA land or right-of-way, like the bus parking lot in the photo, have no legal defense to it being seized back by the MTA. Unlike, say, Texas, where the doctrine of adverse possession means that if you actively squat on a certain piece of land long enough (for example, building one’s fence to encompass some of a neighbor’s property) unchallenged, you can legally claim it. Adverse possession is a legal concept that basically means if you make use of someone else’s land and they have notice of the use, after a certain period of time without action from the legal owner, that land becomes yours. This concept doesn’t apply in New York to land owned by the state. Thus, the bus parking lot can’t claim they’re owed acquisition costs or fair market value for that land if it’s still reserved as part of the LIRR right of way. The parking lot pictured above, that formerly contained the connection between the Atlantic Branch and the Rock Park Line, is NYC DCAS property, not MTA. Those who lease or use former Rock Park Line ROW property may choose to resist via NYC City Council. …Rockaway Beach Branch not Rock Park Line. Anyone have a link to a good map or overlay of the route? Cap’n Transit has one on the subway map here. The ROW is easily visible from Google Maps’ satellite view too. A flyer from a reactivate line booster. Use the Block & Lot tab on the top. It will show one of the former Rockaway Beach Line ROW lots. The other lots are adjacent. Regardless whether this train line is built or not, why doesn’t the state start charging for the presumably illegal use of their land by a commercial (?) enterprise? And seek back rent as well? Would this not be possible? Probably because it is neither state land, nor an illegal use There is a lease with the City for use of that property. As there is 2 miles to the North for a parking lot used by the Crescent Condominiums. Alright, I say we have the MTA do the necessary work along the existing ROW with internal TWU labor and see what happens. Get it done in less than a year and within budget or eat your words, Mr. Samuelsen. There are a number of homeowners along the route that have illegally extended their backyards onto the ROW. Some have sold their homes with this illegal squat to others. This is where the adverse possession element not applying will come into play. These people would have to vacate the ROW land, and could be threatened with back rent charges if they don’t. Woodhaven, Ozone Park and the surrounding neighborhoods desperately need this transit expansion option. Having grown up on Woodhaven Blvd and hating the Q11, I can’t tell you how much improvement this would bring to people in the area not illegally squatting on the ROW. Speaking not just for the people currently living there, but also speaking for the million (more or less) people who will be looking for places to live in NYC over the next 20 years, we need to expand the bubble of a one hour midtown/other CBD commute as far out as possible and build places for them to live. We have a housing crisis ongoing for decades; a Rockaway Beach line reactivation is part of the answer to how we address it. We will never stop demanding our train back that was stolen from the people of Queens and the region. People are going back to railways again for many reasons. It’s time to bring back a subway, LIRR, light rail or a bus way. The people are organizing and will win. If we don’t get this line back soon our current elected leaders will become unemployed and getting bus lane tickets on Woodhaven Boulevard.